There’s something super satisfying about having burgers for dinner. 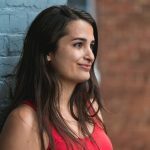 For some reason, they really feel like a special occasion food, or something I’m more likely to order at a restaurant than make at home (though a quick look through my site belies that.. I clearly love making veggie burgers haha). 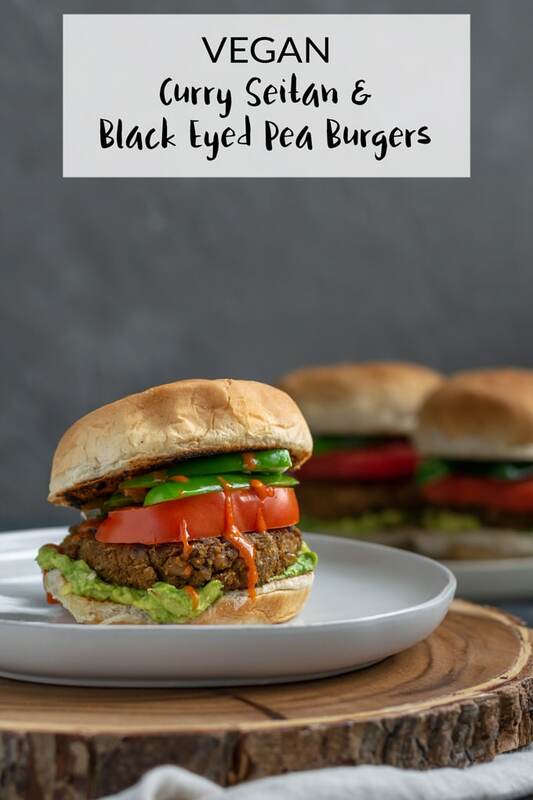 And they’re particularly special when they’re these vegan curry seitan and black-eyed pea burgers, I mean… talk about yum! I don’t know, for whatever reason, I just really like eating [vegan] burgers! They’re handheld so they’re fun to eat, you can get creative with the toppings (or not, that’s cool too), and they tend to cook up in no time! I’ll admit, some of my burger recipes are a tad involved. You might have to cook ingredients before forming the patties, or need to bake them for optimal texture. But that’s not the case with these curry seitan and black-eyed pea burgers! These burgers are incredibly easy to make. I actually made them for the first time as a quick, last-minute dinner. I combined ground seitan, mashed black-eyed peas, and some old malai kofta curry sauce I had sitting in the fridge (plus a few other ingredients) and we were sitting down for dinner less than 30 minutes later. And so I made them 3 more times. Partially because we were really into eating them, but also because I wanted to test gluten free options alongside the very gluten-full one. And then it totally helped that they were so quick to put together and I could cook them as needed! 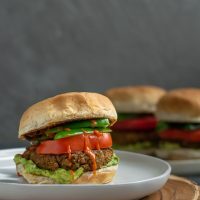 How to make these curry seitan and black-eyed pea burgers? Quite simply! 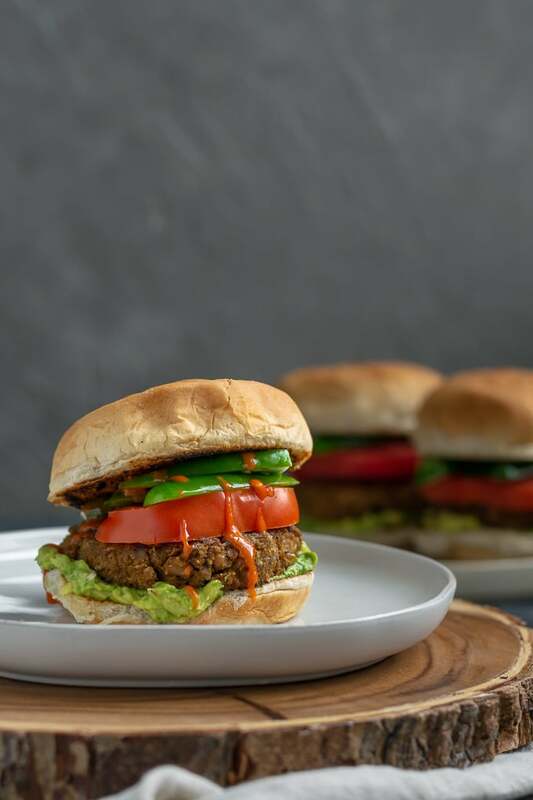 After all, they’re an easy seitan and bean burger–curry spiced, and held together with wheat gluten. Bean burgers on their own have a tendency to be a bit mushy. When you mash up beans enough to hold together (along with a slew of other ingredients, because nobody is eating plain mashed, shaped, pan-fried beans) there’s nothing there to firm up the patties. On their own they’d be soft and have a tendency to fall apart. But along comes seitan. Made from the protein from wheat, seitan has a great “ground meat” texture when chopped up. It’s dense and chewy, salty and usually packed with savory flavor. Mix ground seitan with mashed beans, and they balance each other out to a toothsome but tender veggie burger. Now there are a gazillion ways to make veggie burgers, and this is just one way to do it. But if you’ve never made a seitan and bean burger before, I highly recommend you try it out! So we have seitan and beans, and then add a splash of oil for richness and an improved texture. If you really need to skip the oil, I’d substitute a flax egg (1 tbsp ground flax + 3 tbsp water, left to sit and gelatinize for 10 minutes before using). Most of the ingredients in this burger are for flavor: lots of garlic, soy sauce for the salty umami, curry powder (choose your favorite, we always have madras curry powder on hand), ground coriander, dried fenugreek leaves (optional but they add a little something extra), ground turmeric, a little or a lotta cayenne depending on your heat tolerance, salt and pepper. And then lastly to hold it all together: wheat gluten. Wheat gluten acts as a wonderful binder. I add just enough to hold the mixture together without it getting too stiff. To activate the gluten, a little hands on kneading is required. As you knead you’ll start to see strands of gluten develop in the mixture. A nice thing about gluten as your binder is that you don’t have to add it at the last minute. When using bread crumbs, flour, or starch to bind, they absorb the moisture from the burgers and the longer it sits the softer the burgers become. But with gluten, a rest time will only help the gluten-network develop for an even better textured burger. At the least, it doesn’t hurt it! To cook the burgers, first form them into patties. I like to use a 1/3 cup mixture for a sort of in-between sized burger but you can always use more or less to get the size you want! 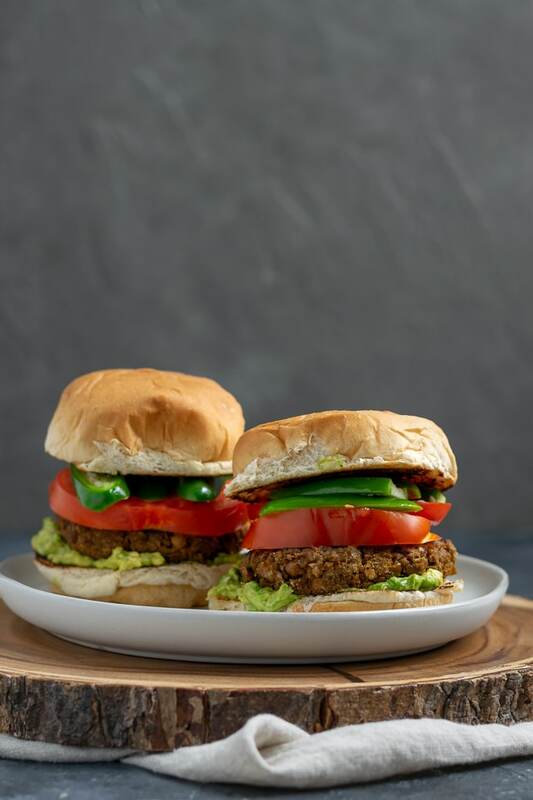 When cooking these burgers, the wheat gluten needs a relatively long time to cook, so keep the heat on a medium-low heat so each side can have a full 4-5 minutes to cook without burning. I’m sure you could bake these for nice results too, but I haven’t bothered! Anyone else noticed it’s hot outside right now??! Now, what if you eat gluten free and still want to enjoy some vegan curry burgers?? Well, luckily for you, I came up with a great variation on these burgers. First, we need to substitute the seitan. For the seitan, any gluten free vegan ground beef will do! There are so many brands out there these days, so use one you enjoy that’s accessible to you! I listed a couple of options in the notes below. You’ll want to make sure you use tamari for your soy sauce, as that is gluten free. And then, we need to replace the wheat gluten. For this, I substituted glutinous white rice flour, often found as sweet white rice flour (don’t worry, it’s not sweet and it doesn’t contain gluten). The sweet/glutinous rice flour acts as a very sticky binder. Therefore, less is used, just 1/4 cup (= 4 tbsp) to the 6 tbsp of gluten. Along with the sweet rice flour a flax egg is added as a secondary binder and for extra moisture. No matter which way you enjoy these, they are super flavorful and delicious burgers. I love their toothsome texture and of course the yummy curry flavor! I think they pair perfectly with my homemade pretzel buns (obviously not gluten-free) and some mashed avocado, tomatoes, jalapeños and a spicy chutney sauce. They’re delicious stacked with double patties and with a slice of vegan cheese melted overtop. 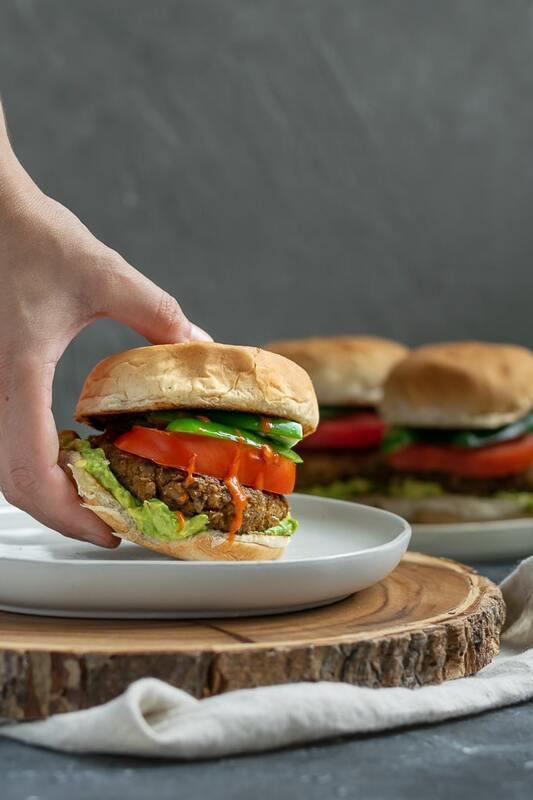 Lettuce, mayo, caramelized onion, mango pickle.. all of these are delicious ways to enjoy these vegan curry seitan and black-eyed pea burgers! I do hope you guys enjoy these vegan curry burgers. If you try them I’d love to know which variation you had (gluten-full or gluten-free) and what toppings you enjoyed them with! If you make them, leave a comment and rate the recipe below! And don’t forget to tag your recreations @thecuriouschickpea and #thecuriouschickpea on Instagram, I love seeing your photos! Gluten free alternative: use a gluten free vegan “ground meat” product like Smart Round by Lightlife Foods or Beefless Ground by Gardein. Substitute the 6 tbsp of vital wheat gluten with 1/4 cup glutinous white rice flour and 1 flax egg (1 tbsp ground flax + 3 tbsp water, mixed together and set aside for 10 minutes to gelatinize). You can use up to 12oz of the vegan ground in this recipe without making other changes. 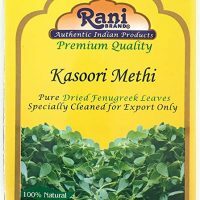 Use tamari for your soy sauce. Feel free to substitute black beans or pinto beans for the black-eyed peas. You can make your own seitan, or buy it from the store. These burgers would be delicious topped with one of these homemade Afghan chutneys! 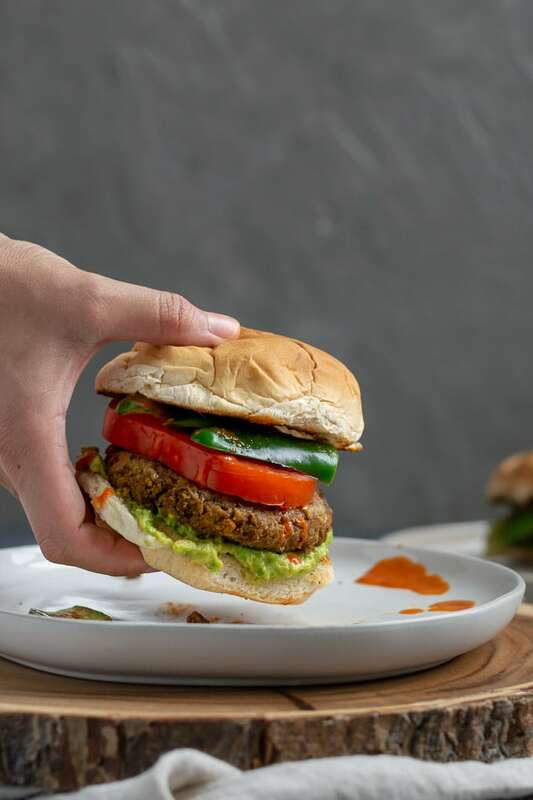 This hearty vegan curry flavored burger is made of seitan and black eyed peas for a protein-packed mouth watering meal. Gluten free option in recipe notes. In a small food processor (or use a knife) chop up the seitan to a ground-meat texture and transfer it to a mixing bowl. Next mash the beans either with a fork or with the food processor so they are mostly mashed but with some texture and whole beans remaining. Add these to the mixing bowl with the seitan. To the mixing bowl add the garlic, oil, soy sauce, curry powder, coriander, fenugreek leaves (if using), turmeric, and cayenne (1/2 tsp for a mildly spicy and 1 tsp for a spicer burger), salt, and pepper. Mix thoroughly to combine. Add the wheat gluten and knead by hand for a few minutes for the gluten to develop. At this point you can let the dough rest and it can be formed into patties and cooked any point in the next day or so, or you can immediately form into patties and cook. Form the patties using 1/3 cup measure. Scoop the mixture and form into a burger by hand. Set aside and repeat with remaining mixture. Heat a skillet or griddle over medium-low heat and lightly oil. Fry the burgers about 4-5 minutes on each side. 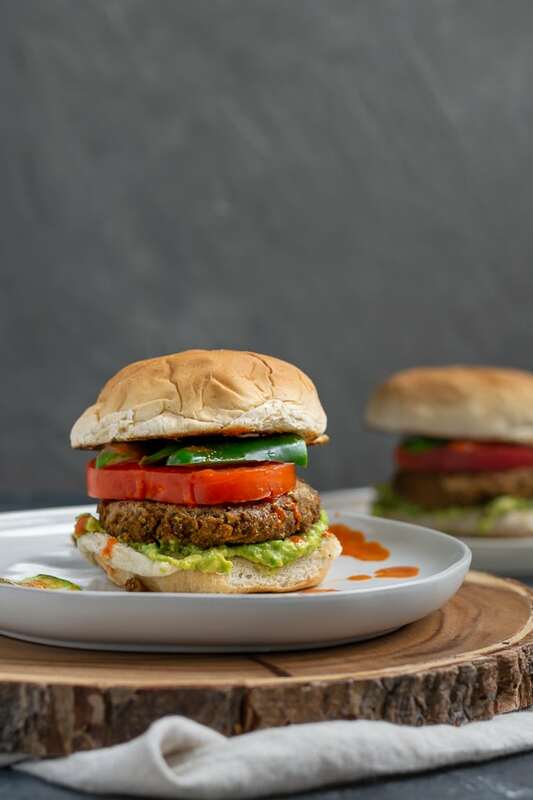 Enjoy the burgers with avocado, jalapeños, tomatoes, and a spicy chutney! Or whatever toppings you enjoy!